No29 [Regeneration] Watch out, construction in progress! Four years have passed since the earthquake on the 11th of March 2011, and the city is starting to get back into shape once again. It is four years since the great earthquake struck northeastern Japan on the 11th of March 2011. Less than a year later, the government established the Reconstruction Agency, with a mission to rebuild within 10 years of the disaster hitting. For a period of 5 years after the earthquake, the state will fund the initial intensive reconstruction efforts. Although Prime Minister Abe Shinzo supported Tokyo’s bid to host the 2020 Olympic games, he nonetheless declared “without reconstruction of the devastated regions, there will be no recovery for Japan”. However, the fact remains that those areas that have suffered damage will not receive any direct funding from the state from 2016 onwards. This is why we intend to review and assess the situation in the 6 prefectures and 62 towns affected. To learn more, we have travelled to Ishinomaki, in Miyazaki Prefecture, and to the headquarters of the Ishinomaki Hibi Shimbun, a local daily newspaper with whom we have been collaborating since March 2011. Located 420km northeast of Tokyo and 50km away from Sendai on the Pacific Ocean coast, the city of Ishinomaki suffered the largest number of casualties, with 3,700 dead or missing. At the time of the earthquake, a 8.6 metre high tsunami crashed over the the port town and laid waste the industrial and residential districts. The wave surged up the river Kyu-Kitakami that cuts through the length of the city and reached the town centre, where it caused immense damage. Looking more closely at the statistics, we see that 73km2 , equal to 13.2% of the town’s surface area (555.78km2), was flooded, roughly equivalent to a city the size of Leicester. Because of the flooding, 76% of all inhabited houses, a total of 57,000 homes, were damaged, and 20,000 of them completely destroyed. Since 2012, Zoom Japan’s team has visited the city every year, accompanied by reporters from the Ishinomaki Hibi Shimbun, who know their city better than anyone, to survey the destruction and review the progress of reconstruction. During our latest visit at the end of December 2014, we arrived at Ishinomaki station after taking the shinkansen from Tokyo, and then caught a bus. On the station wall we could still make out the slogan that had been hung there in 2011 “Take courage Ishinomki!”. On this spot, flooded only four years ago, buses now come and go, and workers and students alike crowd the pavement next to a taxi rank. It presents a very ordinary scene of everyday life. Straight ahead, the main street is lined with rows of neat little bars owned by retail chains, just as in any other country town. Here, our attention is inevitably caught by the statues of manga heroes created by Ishinomori Shotaro, a famous mangaka from Miyagi Prefecture. These statues were erected in strategic locations at the station, the main streets and on the banks of the Kyu-kitakami River. They were set up as a part of the “Manga City” campaign that centred on the Ishinomori Manga-kan, a memorial museum dedicated to the author that is built on a little river island. The museum was badly damaged by the tsunami and was closed for a year and a half, but the statues remained standing bravely to attention, as if they wanted to encourage people whose hearts were heavy to have courage as they walked across the damaged city. After the earthquake, Ishinomaki city established a 10 year reconstruction plan with targeted stages along the way. The first three years were for reconstruction, the next four years for regeneration, and the last three years for future development. The plan was meant to be funded within the framework of the government budget for reconstruction, but the decision to grant the funds is agreed at a national level, and because the local authorities need to ask for state endorsement for every initiative, the resident’s demands have not always been fulfilled. This was specially true during the first stage when efforts were focused on rebuilding the basics of daily life and infrastructure, based on the principle “restore as it was before”. A number of initiatives that wanted to take the opportunity to improve on already bad conditions were refused, and the lack of understanding from the state was criticized by those working on the ground. “Just after the earthquake, the situation was so urgent that we could not wait for state approval. Lives depended on the work. Sometimes we had to force things through when faced with an emergency,” a former Council employee tells us. In addition, many companies dealing with the reconstruction were slowed down because of disagreements between the victims as to whether housing or civic buildings should be given priority. The editor of Ishinomaki Hibi Shimbun, Ohmi Koichi, reckons that “these are the reasons you need a leader who is capable of establishing a clear long term plan very early on, and who can present it to the citizens so that it can be realized”. At the present moment, Ishinomaki has just come out of its reconstruction period and has entered the regeneration stage. However, 23,000 people still live in temporary housing or prefabricated houses with a limited lifespan of two years, as defined by regulations drawn up to help victims of the earthquake. Others are living in temporary accommodation rented from the prefecture. After Miyagi Prefecture decided in January that this temporary housing could be used for a maximum of five years, most of the 70,000 victims who live in the 14 affected towns in the prefecture are facing having to find alternative accommodation a year from now. Due to the extent of the damage here, this limitation on temporary housing does not apply to the town of Ishinomaki, and since last year, the administration is obligated to provide social housing at an affordable rent for those who do not have the means to rebuild their own houses. (See Zoom Japan n°19, March 2014) However, social housing occupancy figures are still low, even after a whole year, and the administration is still adamant in its refusal to pay rent to those whose income is unreliable, or the elderly who used to live in their own houses or apartments and didn’t have to pay rent. Because of this situation, many residents are critical of those victims who have sufficient funds but are not independent. Of course, those who lost their homes were granted some relief out of the reconstruction budget, as well as free credit or the cancellation of home loans taken out before the earthquake struck. But despite all this, a return to the status quo does not come without a cost, and everyone has been asked to make an effort to remain self-sufficient and flexible. Now, at the start of the regeneration period, district planning schemes have been finalized, and work has started in some neighbourhoods since last year. On example is Ishinomaki city centre, where public housing for victims has been built, and where residents and shop keepers in Town Hall Street have created a “Neighbourhood Committee”. 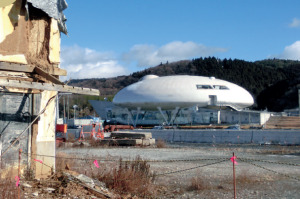 Because its aim is to establish a whole new district, this scheme received advice and help from the office of Urban Planning Studies at Yokohama National University and also benefited from the expertise of a company located in Ishinomaki. The committee set up and presented an action plan to the City Council, focusing on exchanges between new and old residents, ensuring comfort in daily life, holding events and safety. The purview of the plan should come to an end in March 2018. However, many ask why the city centre of Ishinomaki suffered such damage in the first place. It was because there were no dykes running along the river that flows the whole length of the city. This lack of protection is explained in part by the fact that the river Kyu-Kitakami was used as a port in the past. Since 2011, there have been plans to construct protective embankments along the mouth of the river with a maximum height of 8.7m and about 10km in length (10km on the right bank and 9.1km on the left bank). As soon as the building plans for the dykes were approved, the town organized several meetings to pass on information to residents, and the project progressed while taking account of people’s wishes and opinions. Work has finally begun, and these dykes, which incorporate a public footpath, should be completed by next year. Of course, when the landscape undergoes such great change, there are always protests voiced. “We feel like we’re living surrounded by walls.” some say, “It’s even more dangerous if we can’t see the water coming!” say others. There are further, concurrent plans to build residential neighbourhoods and erect breakwaters along the coast where the damage was worst. Minami-hama district, which faces Ishinomaki Bay, was the closest to the city centre, and ended up as an enormous pile of rubble, as did so many other neighbourhoods, but today, the first reconstruction work has started there. The National and Prefectural authorities are planning to establish a park here, along the coast where there were the most casualties and the most severe damage inflicted, to commemorate and reflect on those who perished. Further inland, to the north, is Mount Hiyori where many residents found refuge. At the foot of this mountain used to sit Kadonowaki school – which suffered no casualties despite the earthquake, tsunami and fire thanks to the proper evacuation procedure that had been set up. At the end of 2014, a committee made up of experts from the city and further afield decided to keep the school’s ruined building as a symbolic message, a lesson for future generations. However, some of the survivors do not wish this ruin to be kept, as the sight of it still brings back too many painful memories, and there were many protests demanding that it should be demolished. It would require 300 million to 1 billon yen to maintain the building, even after partial demolition, so the decision remains on hold. Taking into consideration the level of reconstruction work that needs to be done in these devastated areas, it is noticeable that the workforce is insufficient and there is a lack of building materials, with costs continuing to rise. Because of this, the system for submitting quotes for public rebuilding work is not functioning properly, and it seems that delays in projects already underway are causing repercussions for reconstruction throughout the city. With major building work also starting for the 2020 Olympic Games, it will be necessary for Japan to deploy some real organisational skills in order to balance the needs of the past, present and future.